The current line-up of sixty-eight stallions includes Dubawi, son of Dubai World Cup winner Dubai Millennium; Exceed and Excel, the world’s leading sire of juvenile winners and Stakes winners; Derby and Arc winner Golden Horn; Travers and Jockey Club Gold Cup winner Bernardini; and Medaglio D’Oro, sire of Rachel Alexandra, the best three-year-old filly since the 1970s. Over the past 36 years, the basic routine at Darley has changed very little, with the stallions taking part in daily and yearly exercise schedules, and receiving top-quality care from Godolphin’s dedicated team. Throughout the year, stallions are inspected and fed early in the morning. When the grooms arrive, the horses are groomed and their temperatures taken, before they are turned out. The stables are then mucked out, freshened and tidied, and restocked with fresh, clean water. Except in the breeding season, the stallions return from the paddocks in the late afternoon and are bathed, if necessary, to remove any mud, and then groomed thoroughly. Their feet are picked out and examined carefully and hoof oil is applied to each foot. Careful checks are also made for any swelling or cuts and the stallions’ temperatures are re-taken. They are given their main feed in the late afternoon, including warm mash twice weekly. In the early evening, each stallion is inspected to check they are eating and drinking normally. There are closed-circuit TV cameras in each stable and hourly security checks on the stallions are also carried out. In the northern hemisphere, all fit and healthy stallions begin daily ‘walking in-hand’ exercise on 1 December, at which point daily paddock turnout stops and shoes are applied again pre-exercise. Stallions are initially walked for short periods, building up to 1.5 hours over the first two weeks. Twice-weekly lunging is added later on. Weather permitting, walking exercise usually continues until early May and, gradually, daily turnout is added after exercise. After the covering season walking exercise is discontinued and, in most cases, shoes are removed to allow the horses’ feet to grow out naturally. In the southern hemisphere, this routine occurs between September and November. 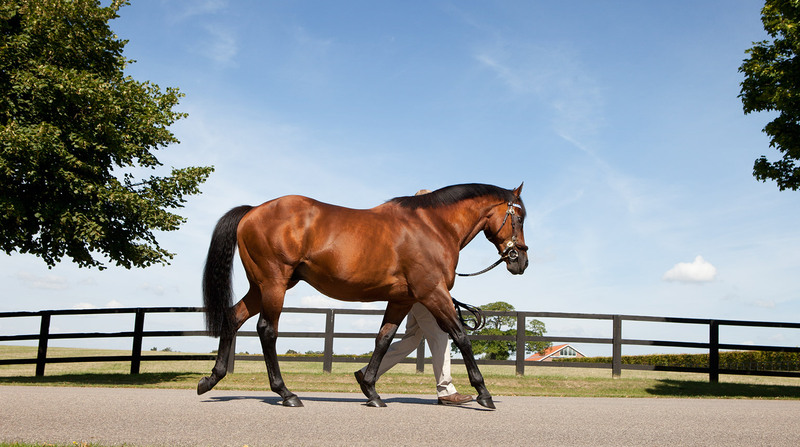 For more information on Darley Stallions.